I drew the F-8 Crusader because I wanted to depict the F-8E(FN) French Navy version. USN, USMC and PhAF versions were also created once I was done with the French birds. 1. F-8E(FN) of Flottille 14.F based at Landivisiau, 1973. 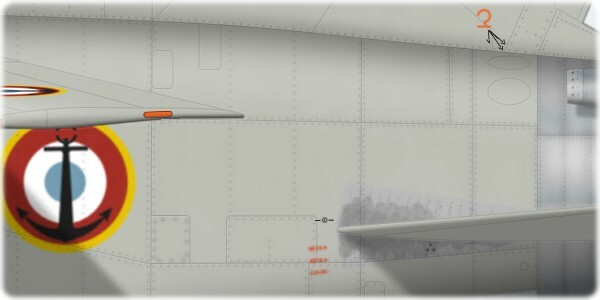 The aircraft is painted in the original Light Gull Grey over Insignia White USN scheme. Stenciling is also of the US kind. 2. F-8E(FN) n°32 was sent by Flotilla 12.F to the Greenham Common Airshow in June 1981 to represent the French Aéronavale.It features a light grey camouflage and no white undersurfaces. 3. F-8E(FN) n°34 of Flottile 12.F carrying two Matra 550 Magic II IR missiles. The “Crouze” could carry AIM-9 Sidewinders or French-built Magic I and II. N°34 was refurbished to F-8P standard in August 1993. The F-8P was basically an overhauled F-8E(FN) with some extra avionics and a RWR installed in the fin. 4. In June 1994, F-8P n°3 (BuNo 151734) of Flotille 12.F based at Landivisiau NAS received “invasion stripes” to commemorate the 50th anniversary of the Normandy landings. 5. This is F-8P (P stands for Prolongé – extended life) n°10 of Flotille 12.F. This aircraft is preserved in the Le Bourget Air & Space Museum. 6. F-8A n°143694 of Marine VMF-215 “Fighting Corsairs”. This unit, based at Olathe NAS received F-8A Crusaders in 1964. This specific aircraft appeared to have paint patches of a darker shade than Light Gull Grey applied at different locations. The “7K” tailcode was changed to “5K” in 1968. 7. F-8K n°145562, Andrews AFB, 13 April 1972. When VMF-321, a Marine Air Reserve unit, converted to the F-8K, it introduced this flamboyant livery of dark blue with white stars. VMF-321 also changed its name from “Hell’s Angels” to “Black Barons” during that period. 8. F-8C n°145558 of VF-84, USS Independence. The “Vagabonds” flew some of the most highly decorated Crusaders ever. The name “Vagabonds” was later replaced by “Jolly Rogers”, since most VF-84 personnel came from the recently disestablished VF-61 “Jolly Rogers”. 9. F-8E n°150869 of VF-191, NAS Lemoore, California, June 1966. This aircraft was assigned to the commander of Carrier Attact Air Wing 19 as written under the wing. 10. F-8J 150654 of VF-302, NAS Miramar, 1971. 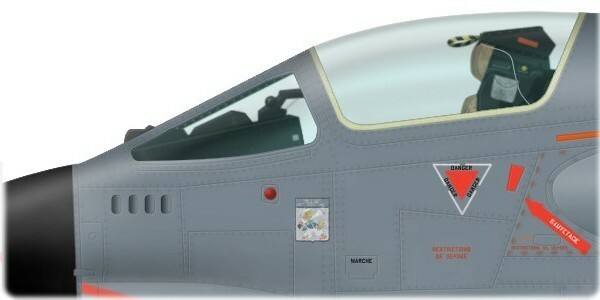 The “Stallions” were the sister squadron to VF-301 and shared the stylised ND of Reserve Air Wing 30. VF-302 flew Crusaders for only 30 months before converting to the F-4 Phantom II.